Check out all homes for sale in the master planned community of Sterling lakes in Iowa Colony, ideally located at CR 56 and Hwy 288 about 3 miles south of Highway 6. Homes are priced from mid $100's to $300's and builders include CastleRock, LGI Homes, Westin Homes and Dr Horton. Let our Buyer's Specialist help you from start to finish throughout the building process. Residents of Sterling Lakes enjoy the privilege of living in a community powered by En-Touch services. This exclusive benefit gives each resident discounted bulk services, including high-speed internet and home security monitoring. Family-style recreation abounds in Sterling Lakes with the $2.5 million Recreation Center Complex that centers around SplashPad Texas. The water park and recreation area with chateau clubhouse and playgound features enough attractions to entertain a large family all year round. Enjoy the family-size playground, complete with tunnels, climbing equipment and a tike-bike trail. The SplashPad complex has covered pavilions, exercise room, complete with picnic tables and benches for resident gatherings. You couldn't ask for a better place to live! 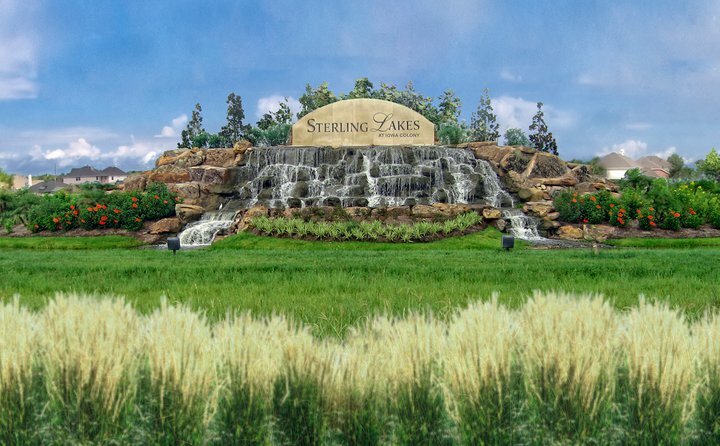 Call our office today at 713-733-8200 for more information on any of the homes listed below or a new home consultation, we would love to find your next home in the Sterling Lakes community!